The Dolphin had a new landlord in 2015,he has made a big difference,now a pub to seek out rather than avoid. Chance find while walking the back streets. Summer lightning on top form and a basic clean and friendly pub. found it a decent enough pub - the crop circle and summer lightning were good and it is handy for the station. I called into The Dolphin briefly last week and found it to be looking really good - Colin the new Landlord is doing a good job. 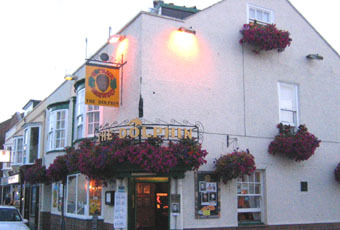 The Dolphin has reopened (last week) under new management. Hop Back's web site currently says "reopens Thursday 16 May will (sic) new landlord, Colin. Lord Burninbum of the Chalfonts and I dropped in yesterday and had a couple of pints of Crop Circle each. The place seems to be on the up.